The other day I had a craving for Milanesa de Res that just wouldn’t go away. What’s milanesa? It is beef pounded thin, lightly breaded and fried quickly on both sides. A friend of mine said, “It’s like the Mexican version of chicken-fried steak.” I guess you can say that’s true. The craving wouldn’t dissipate, so I finally packed up Art into the car and headed to local East LA Mexican hole-in-the-wall called Cemitas La China Poblana and had a torta filled with milanesa de pollo. I realized we didn’t have milanesa on our blog. It’s a staple in Mexico and Latin America. I’ve made it before, but just never took the time to document the recipe. What’s the origin of milanesa? 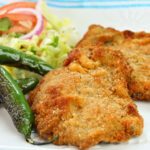 The milanesa (in Italian “cotoletta alla milanese”) is a South American variation of an Italian dish where generic types of breaded meat fillet preparations are known as a milanesa. 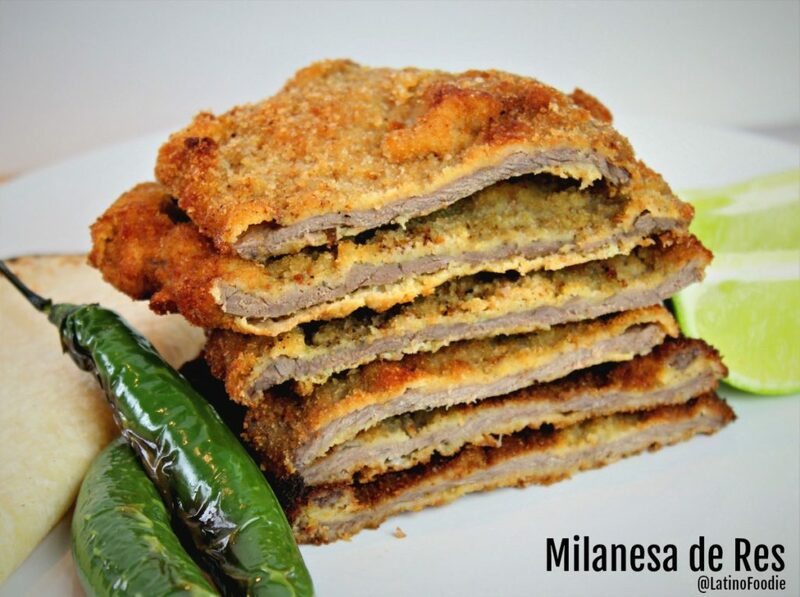 A milanesa consists of a thin slice of beef, chicken, veal, or sometimes pork, and vegetables like eggplants. 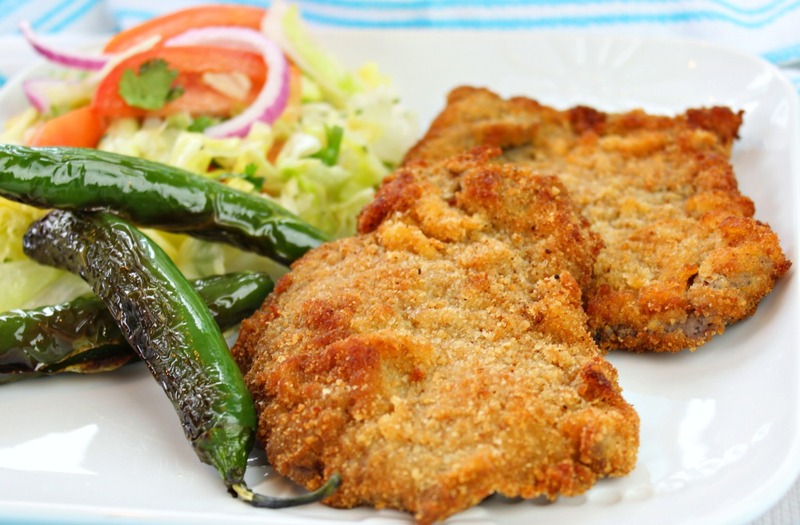 In Mexico, the most common milanesas are made with beef or chicken. You’ll often see pieces of the fried meat as large as dinner plates leaving no room for the sides, which are served on separate dishes. Typical sides include a simple salad with tomatoes and raw red onions with a squeeze of lime juice, fried or boiled potatoes or a side of rice and beans. I’ll also warm corn tortillas and drop a few jalapeño or serrano peppers into the scorching oil after I have cooked the meat. It makes the perfect bite. The recipe below is made with plain breadcrumbs, but I have seen cooks make milanesa with grounded crackers, tortilla chips and corn flakes believe it or not. 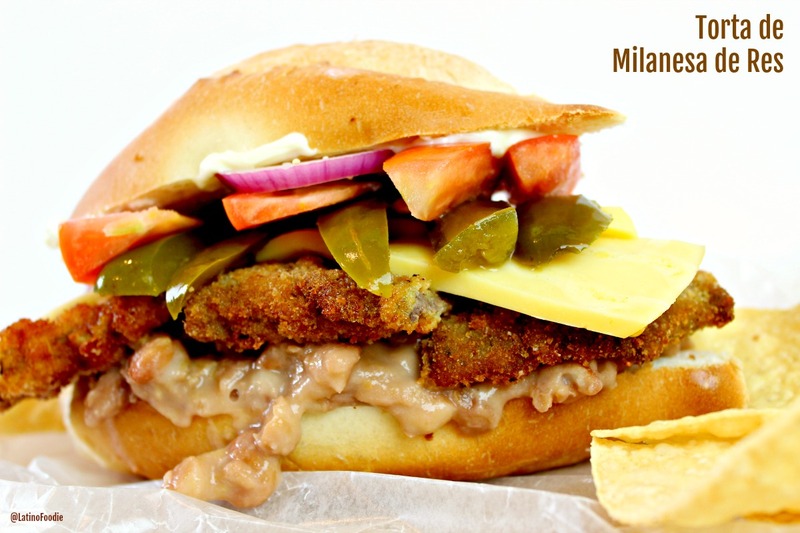 One of my favorite ways to eat milanesa is stuffed in a bolillo (a soft, medium-sized bread roll) and build a torta sandwich filled with mayonnaise, refried beans, slices of avocado and panela cheese, tomatoes, slivered pickled jalapeños, thinly sliced red onions, and pieces of the milanesa de res or pollo. I call this #Fatboyheaven. In a large bowl or deep baking dish, season your beef with salt and pepper. In a medium-sized bowl, whisk the eggs. In another pie plate, combine the plain breadcrumbs, ancho chile powder, salt, black pepper, garlic powder and dried Mexican oregano. Using your hands or kitchen tongs, place the beef one-by-one into breadcrumbs, turning to coat both sides. Next, dip the beef into the whisked eggs and finally into the breadcrumbs. Lightly pat the steaks so the coating sticks. Place the breaded beef aside on a plate. In a large, deep skillet, heat 1/2 inch of oil over medium-high heat. Make sure the oil is hot before placing the steaks. Fry about 2 minutes on each side until golden brown (this will happen faster than you think so don't walk away) on both sides and cooked through. Place the steaks on paper towels to drain any excess oil before serving. Wow, I just figured out where milanesa comes from. It’s actually German schnitzel brought to the Americas by the Spaniards. First I found out that only thing about albóndigas that isn’t Persian are the corn tortillas instead of pita bread and then this. I’m guessing step #5 you coat the beef with flour first, then the egg, THEN the breadcrumbs.. ? Yes, coat the beef with flour first.